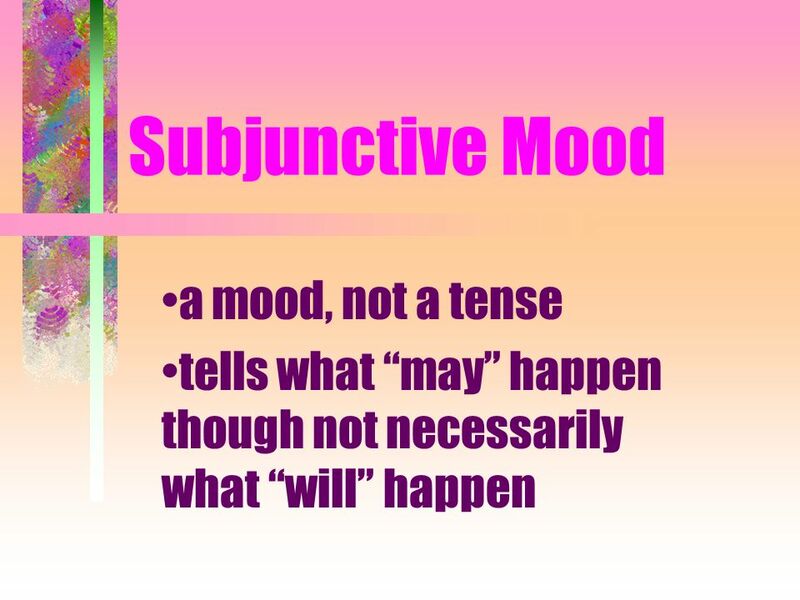 Subjunctive Mood a mood, not a tense tells what may happen though not necessarily what will happen. 2 You have learned the Indicative mood. 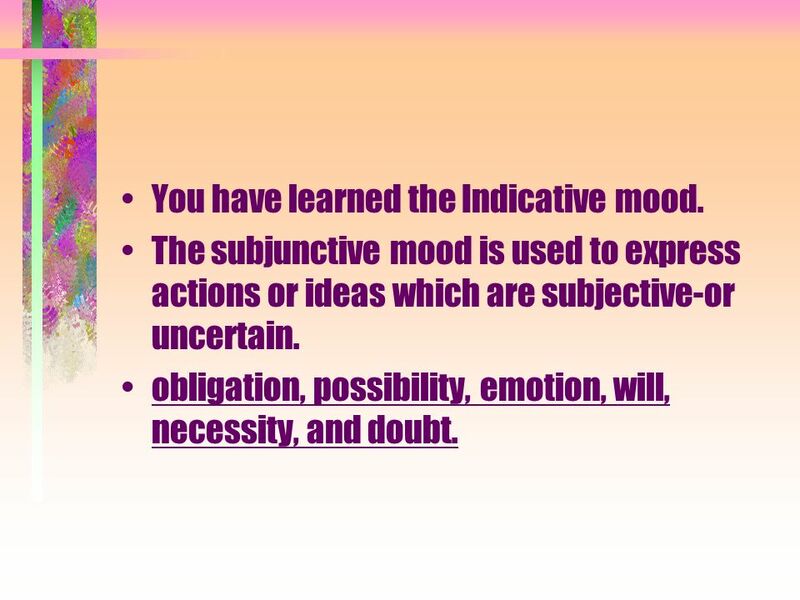 The subjunctive mood is used to express actions or ideas which are subjective-or uncertain. obligation, possibility, emotion, will, necessity, and doubt. 3 is not commonly used in English today. 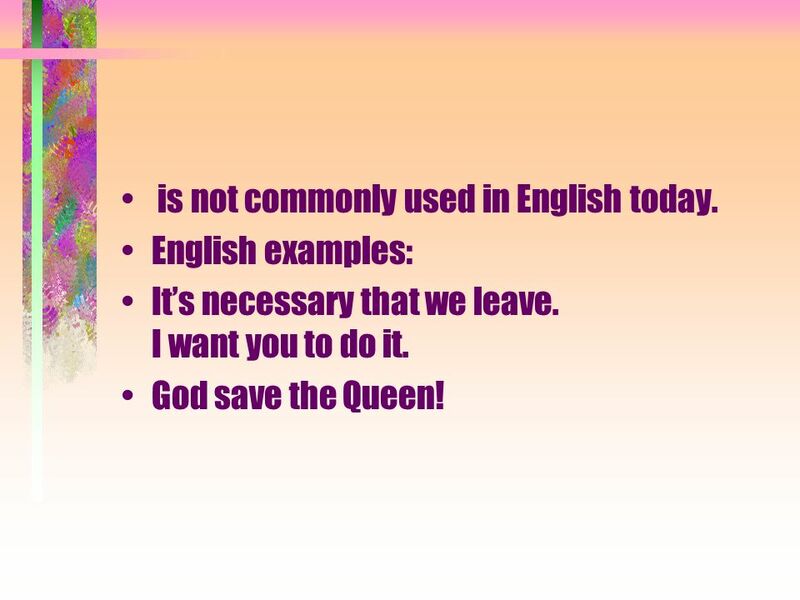 English examples: Its necessary that we leave. I want you to do it. God save the Queen! 4 not a "fact" expressed by the sentence.. 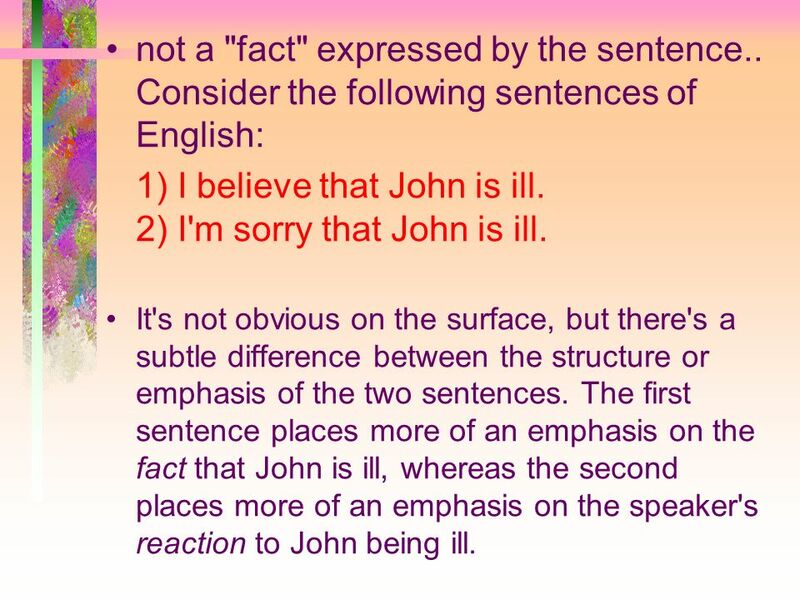 Consider the following sentences of English: 1) I believe that John is ill. 2) I'm sorry that John is ill. 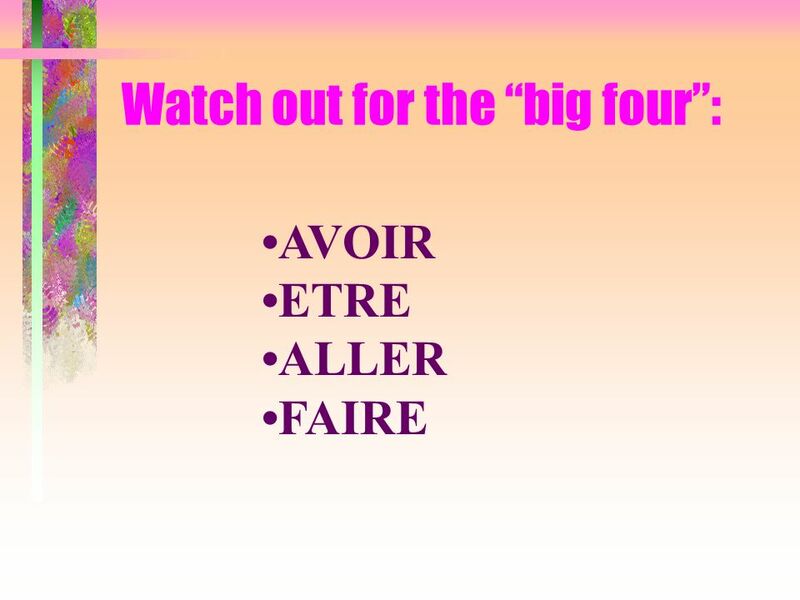 It's not obvious on the surface, but there's a subtle difference between the structure or emphasis of the two sentences. 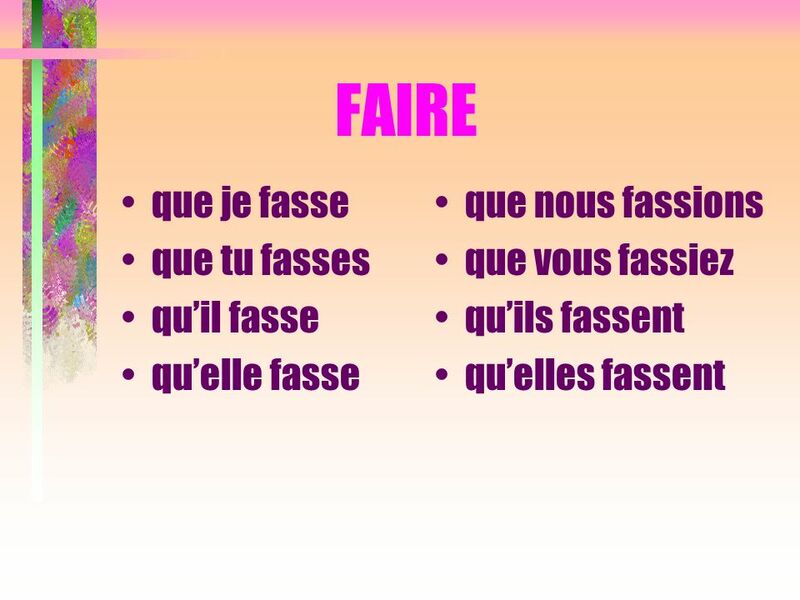 The first sentence places more of an emphasis on the fact that John is ill, whereas the second places more of an emphasis on the speaker's reaction to John being ill.
5 In French, we show this difference of emphasis with a subjunctive verb form. The I believe... case is expressed with a "normal" (indicative) present tense verb. Je crois que Jean est malade. 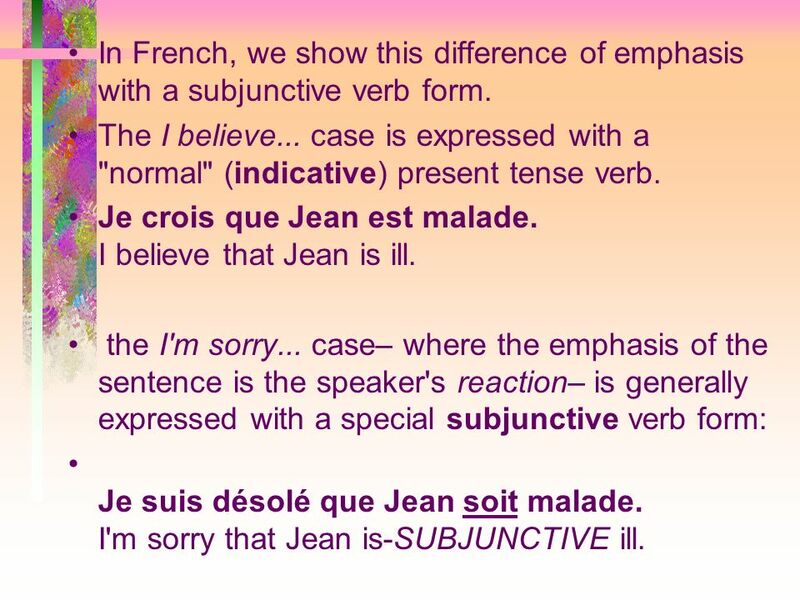 I believe that Jean is ill. the I'm sorry... case– where the emphasis of the sentence is the speaker's reaction– is generally expressed with a special subjunctive verb form: Je suis désolé que Jean soit malade. 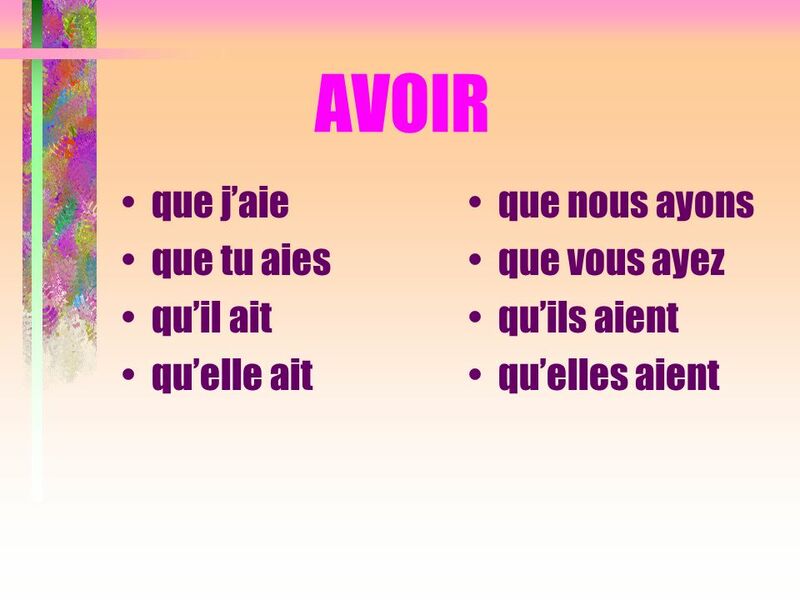 I'm sorry that Jean is-SUBJUNCTIVE ill.
Télécharger ppt "Subjunctive Mood a mood, not a tense tells what may happen though not necessarily what will happen." Verbes en -er Monsieur Clark. 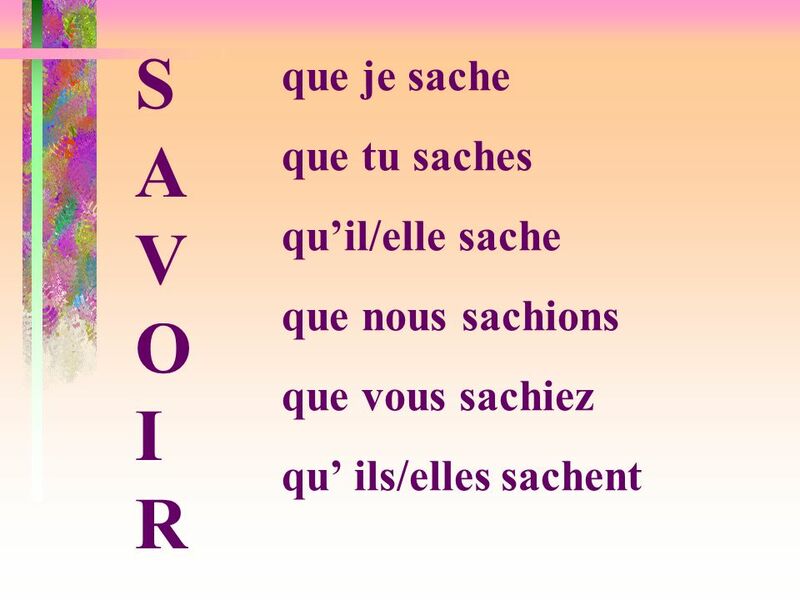 Infinitive The form of the verb we find in the dictionary is called the infinitive. 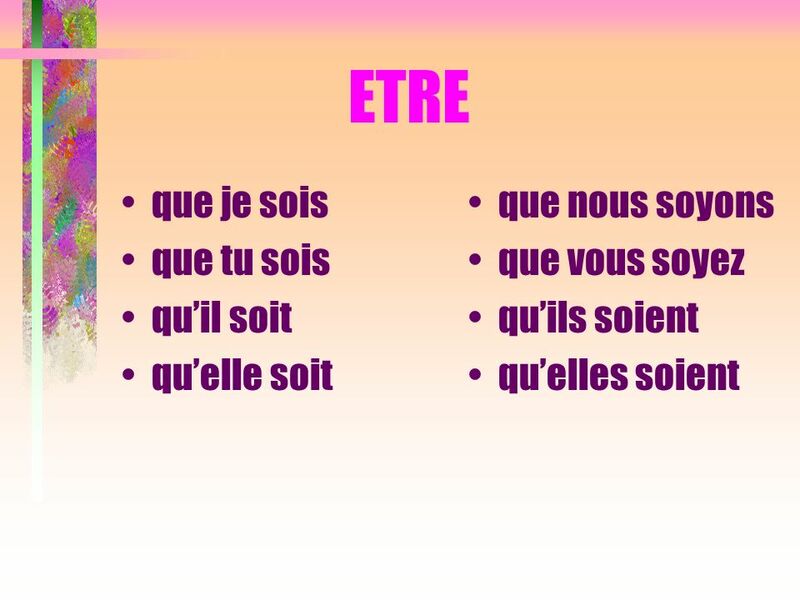 1 La norme: Comparisons 4.1: Understanding the nature of language through making comparisons. 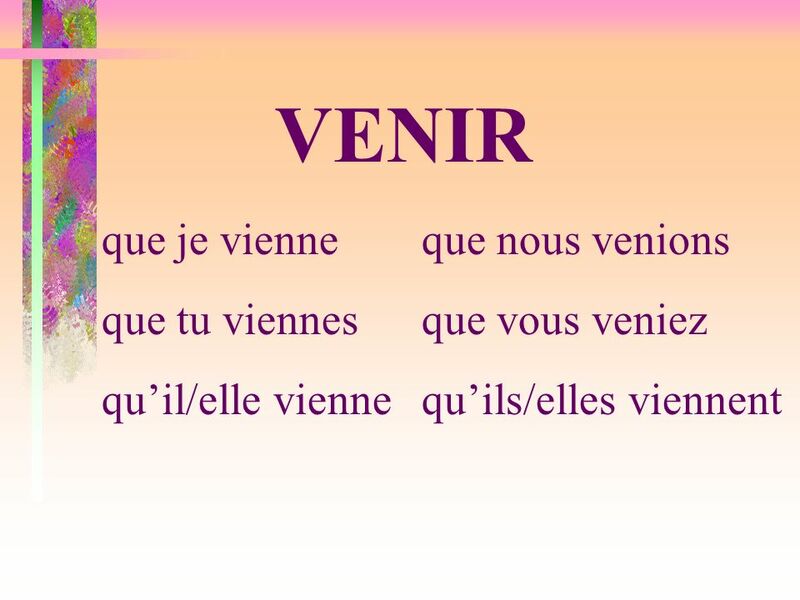 Le présent Present tense The present tense describes what is happening now. 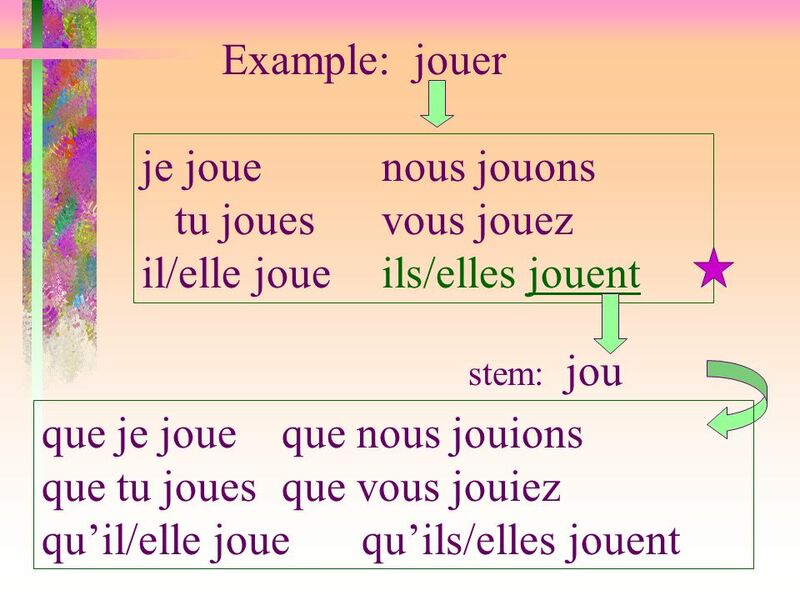 Le subjonctif This tense is good for showing off! 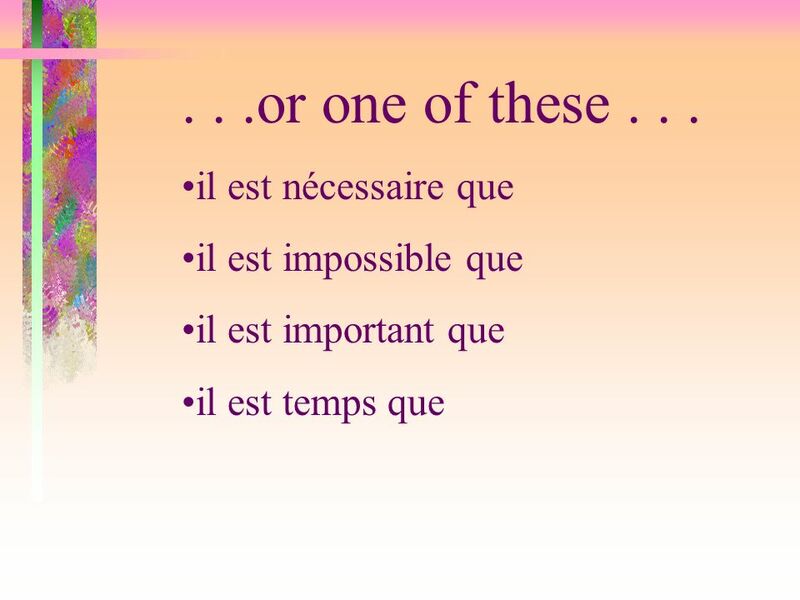 You will need to understand how and when use it as it is a useful tense for your expression of ideas/doubts. 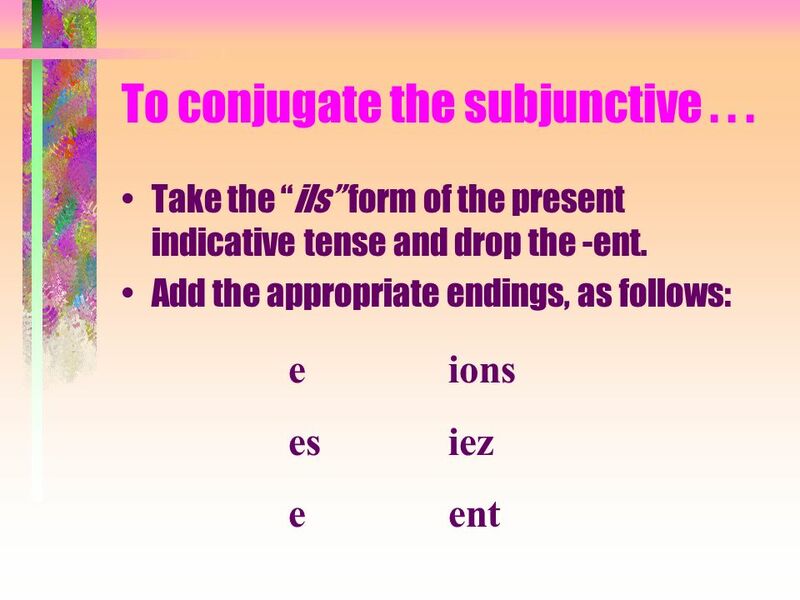 The Present Subjunctive The Subjunctive l Up to now you have been using verbs in the indicative mood, which is used to talk about facts or actual events. Le Subjonctif Par M. Rocque. 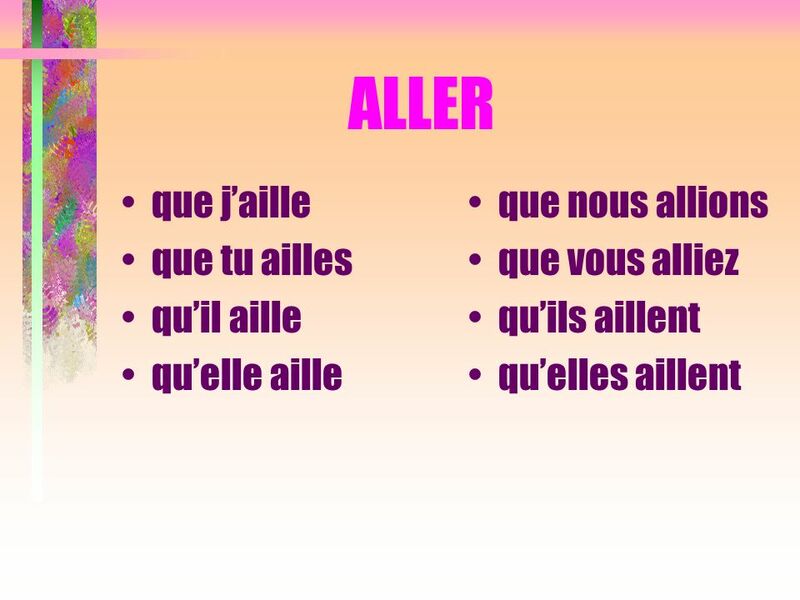 La Formation For all regular verbs (-ER, -IR, and -RE), take the 3rd person plural form (ils) of the present tense of the. Smoking a regular verb cigar: the –er version The keys to putting together what you want to say! 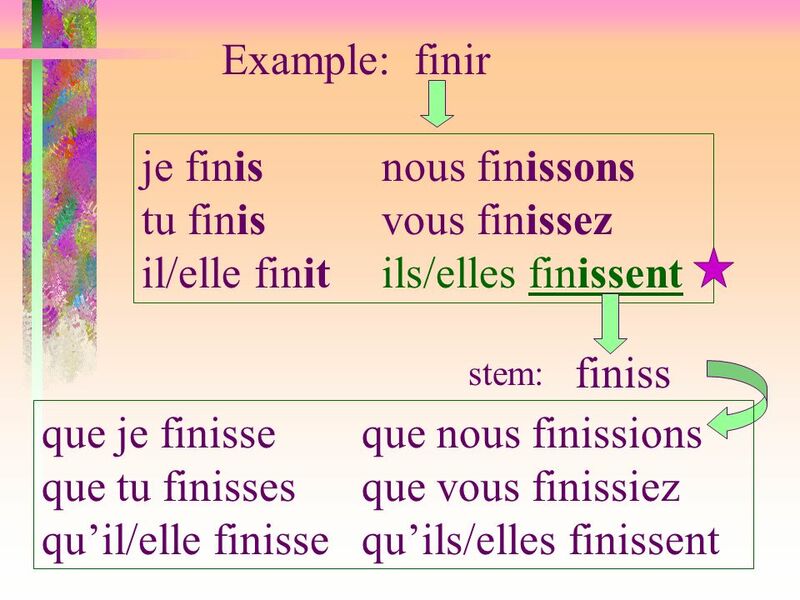 Français III: les notes #2 19.3.12. 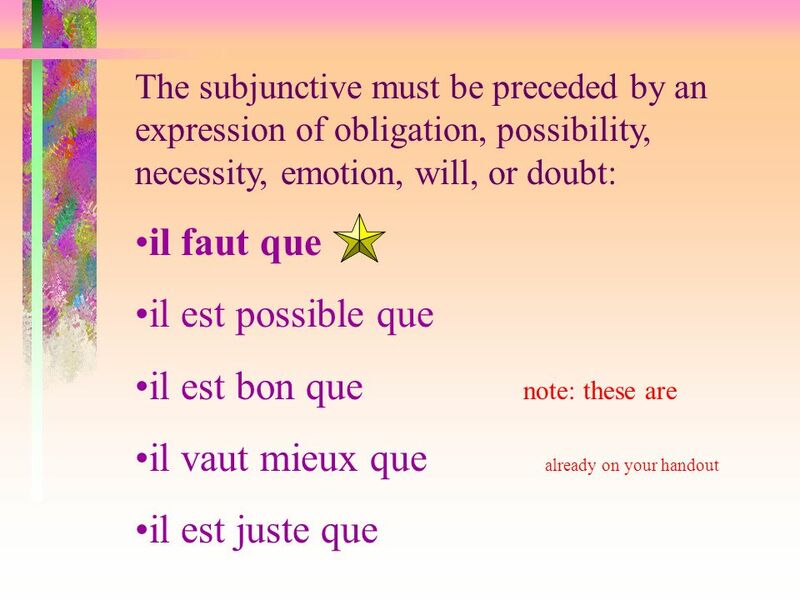 Le subjonctif The subjunctive is not a tense, but a mood The present, imperfect, passé composé, and future are in.